Cover: Camera Austria International 138, 2017. After the loss of the majority of certainties in the understanding of photography, after all of the excessive accessing of photographic images, it seems appropriate to ask the question: how did it get this far? Which “turns”—the historiographic, the archival, the research, and the postcolonial turns—have served to affect, change, revamp? What can be said about photographic images in a time of the post-documentary, and the post-photographic? What comes after the unease about representation, and what disquiet has seized the photographic images of today? 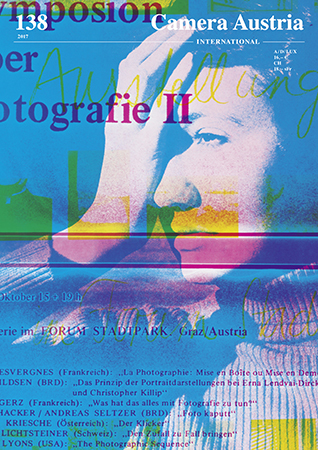 A glimpse into the archive at Camera Austria attempts to trace several of these winding paths of “the photographic.” In this special issue, which consists of image material from Camera Austria‘s archive and an essay by Reinhard Braun (artistic director and publisher of Camera Austria), we revisit some turning points in the debate about the photographic image—not as knowledge that has been set aside, but in an attempt to hold on to that which Walter Benjamin called the incompleteness of the past. This archive for instance also accommodates the artists’ invitation to the Symposium on Photography XV devoted to the topic “Archive,” documented in issue 51/52 from the year 1995: “Using the term archive, we correlate artistic methods and their underlying concepts with cultural systems of rules and approaches taken … This broadening of the term archive denotes not only the approaches themselves—the activities of recording, collecting, and storing knowledge—but also a social dispositif (Michel Foucault): it links strategies of appropriation and safekeeping with those related to the creation of order, with demarcation and dislocation. In this sense, the archive represents and signifies the constant disciplining and structuring of the world.” However, it was in the 1990s especially that the concept of the archive—as an objective source and system of structuring knowledge—began to destabilize and to dissolve the bonds between archive, documentation, and memory. The return of the real (Hal Foster) and the ethnographic “turn” of the 1990s then moved the issue of documentation in directions that were simultaneously more speculative, provisional, and political. The archive went from being an institution to being a process, with artistic practices not only critically addressing existing archives, but now also themselves creating archive-like collections of documents and narratives. The archive was ultimately to become a shared space for producing dispersed knowledge over the course of digitalization. Furthermore the issue of the archive in the scope of artistic practices often deals with the “blind spots” of history—blind spots which, however, are certainly no less meaningful. Rather, they represent nodes of various narratives that, in turn, have not been granted consideration by official archives. “Ghostly ‘voices’ draw their tenacious presence from what is left unsaid, unrepresented, from the blank spaces, the lost or never-told stories … These ‘ghosts’ demand entry into our texts, our systems of inscription and our representations, despite the frequent claims that apparitions are nothing but sensory illusions, even hallucinations” (Peggy Buth). The Camera Austria archive is neither the result of artistic practices, nor can it be stylized as an archive of suppressed or political nature. Yet it can be assumed that there are zones of visibility and of invisibility in this archive as well, that certain associations more clearly rise to the fore than others, and that it is permeated by gaps. Some trails in this preliminary and immanently incomplete archive might point out to us “that, in order to move forward, we must first take a few steps back, so as to embark upon previously abandoned paths” (Allan Sekula). However, embarking upon such previously abandoned paths only makes sense if we don’t try to smooth out contradictions that we encounter, but rather engage in work with the archive without “having an answer at the ready, before the complexity of the question is understood” (Karen Knorr).